An investigation is underway into a fire that broke out over the weekend at the historic former factory used by Guest & Chrimes on the edge of Rotherham town centre. Five fire engines from Rotherham, Elm Lane, Parkway, Maltby and Aston Park stations were called to the scene at 3:50am on Sunday morning, July 1. 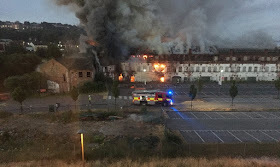 Well alight when crews arrived, the large premises are on Don Street between Rotherham Council's Riverside House and Rotherham United's New York Stadium. Firefighters used hose reels to tackle the blaze and there was a large amount of smoke in the area. South Yorkshire Fire & Rescue (SYFR) took to social media to urge people in the area to keep doors and windows closed. SYFR said that an investigation into the cause of the fire would take place once it is completely out and structural assessments of the Grade II listed building will have been undertaken. Opened in 1857, the history of the works is of national and international significance due to the role of the Guest & Chrimes business in pioneering the design and manufacture of brass valves and screw-down taps across the world. The firm once employed thousands. Empty since 1999, the site was purchased by Rotherham Council for £2.6m from developers, Evans in 2010 and is now controlled by the football club which has a very long lease from the Council. The club gave an update on the site in September last year after the town centre masterplan outlined an aim to create a focus for recreation and sporting activity in the town. Talks had been ongoing with investors regarding a trampoline centre as well as discussions with Historic England over the reuse of the site. The masterplan states that Historic England will be positive and flexible if the "right" conservation approach is taken. Details such as the water tower, front range, waterside entrance and general layout of the buildings are highlighted but the masterplan concludes: "As many of these features as possible should be retained or incorporated, but it is recognised by all that change and some demolition will be necessary to deliver a viable and deliverable scheme." Consultants for the club, Gleeds, estimated that it would take an investment of £8.8m just to bring the current property up to a marketable condition and said that there had been little interest from developers in doing so. Lets hope the Bulldozers move in pretty soon,this carbuncle on Rotherham town centre is well over due pulling down and a new development in.its place! I hope this renews efforts to see G&C brought back into use. We've lost far too much of Rotherham's heritage. Buildings like this could be amazing... just needs a bit of vision. Let's not send the bulldozers in just yet - Once buildings like this are lost, they are lost forever. These buildings can’t be recreated and it is a sad loss to Rotherham and it’s industrial past. It looked good in the regeneration plans. Such a shame.